Minus the Bear has been making albums with their unique sound -- a blend of electronics, guitar-taps and sophisticated time signatures -- since 2001. To celebrate the 10th anniversary of their incredible album Planet of Ice, the band is touring the country playing the album in its entirety, including in front of an enthusiastic crowd at Town Ballroom on Tuesday, May 1st. Seeing them perform this album start-to-finish is just as exhilarating as hearing it for the first time. The Coathangers opened the show. The group, a three-piece riot grrrl group from Atlanta, GA, fuses influences from bands like Sleater-Kinney and X, mixing punk, surf and psychobilly into their very brief songs. It wasn’t an easy set to sit through. While the set was full of high-energy songs, you couldn’t tell that from looking at the band, who just stood there looking like they had no interest in being there. They started getting into it for the final two songs of the set, but by then it was too little, too late. All three members sang, some more successfully than others. Guitarist Crook Kid Coathanger sounded like she was trying to do her best Sleater-Kinney impression, but she ended up sounding like a broken squeaky toy (which, ironically, is a sound she sampled for the final song). Bassist Minnie Coathanger chimed in with vocals here and there, but her quiet, calm voice doesn’t fit with the rest of the band and could barely be heard over the rest of the band. Drummer Rusty Coathanger sang a good majority of the time, with a visceral growl reminiscent of Dee Dee Ramone. She was the most engaging member of the band by far, however there was a reason Dee Dee Ramone wasn’t the lead singer. I didn’t really see much musicianship in any of them. The bass lines were typical and cookie cutter. The drums were fine some of the time, but Rusty has some serious tempo problems. Crook Kid’s guitar leads were pretty entertaining, but when she slipped into more rhythm-centric parts, she showed a complete lack of creativity. This pointless exercise in testing my patience reminded me of a marginally good high school band. 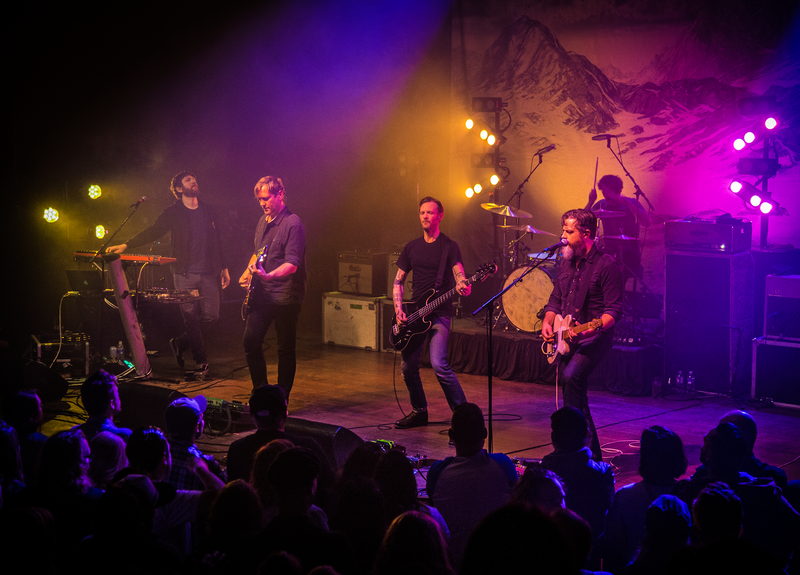 When Minus the Bear took the stage, they made the wait well worth it. They opened with “Burying Luck” to uproarious applause. Their stage show was thoroughly entertaining, with a giant mountain backdrop and awesome lighting effects that lit up every corner of stage. Heads instantly started bobbing as soon as the first song kicked off . By the time they got to track two, “Ice Monster,” everyone in the band was fully immersed in the set. Vocalist Jake Snider’s soulful howl of “You’re never gonna see her again” was full of angst and conviction. “Knights” had beautiful-sounding harmonized guitars. Dr. L’Ling showed off the band’s prog rock influences with cool riffs and seering solos. You could hear bits and pieces of bands like Kings of Leon, Pink Floyd and Led Zeppelin in Minus the Bear’s truly innovative composition. The overall sound was great, with all five musicians coming through loud and clear. The band uses vocal harmonies to great effect, backing up Snyder’s strong vocals, which resonated in every corner of the building. Songs like “Knights,” “Throwin’ Shapes” and “Double Vision Quest” featured beautiful guitar interplay between Snider and guitarist Dave Knudson. 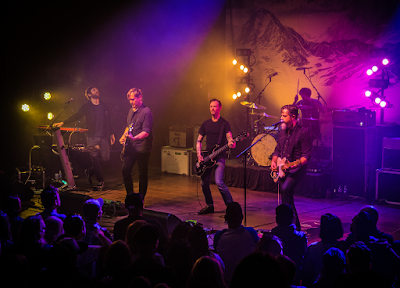 Minus the Bear gives off the energy of a hardworking, blue-collar band. They left it all on the stage for their fans, who were happy to reciprocate with some of the loudest applause I’ve ever heard at Town Ballroom. The enthusiastic crowd danced, cheered and sang along all night, lost in the music, which was easy considering how flawless their performance was. Every rock show should be like this. Ryan Gurnett has a B.S. in Music Industry from The College of St Rose. He has worked as a studio engineer, live sound engineer, producer and sound editor and has been a musician for 25 years. He is currently the co-host of The Struggle is Real Buffalo Music Podcast and bassist for The Lady, or the Tiger?. Email him at SirWilliamIdol@gmail.com or find him on Twitter @SirWilliamIdol.